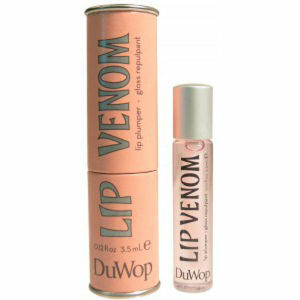 'Venom Flash Gold from DuWop has the same spicy tingly shape plumping formula as original 'Lip Venom' plus it's spiked with a subtle gold shimmer. A must you want to 'Bee' kissed and sparkle. The same tingly formula from Lip Venom is used as a base in Venom Flash, to which we added tiny particles of mica*. Mica* is a mineral known for its beautiful pearly shine, and combined with the Lip Venom formula, gives lips a shimmery luster.